The four of us from my last post have embarked upon a campaign. 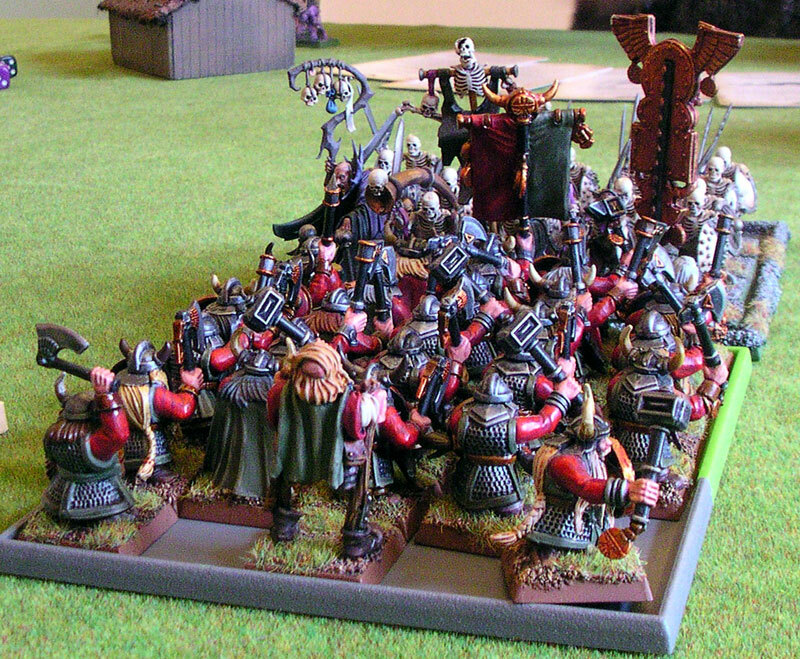 We're using the rather splendid Warlord Campaign Rules. 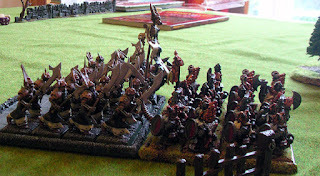 There are two Vampire players, Hall-Scurry the Skaven and my mighty Chaos warriors. 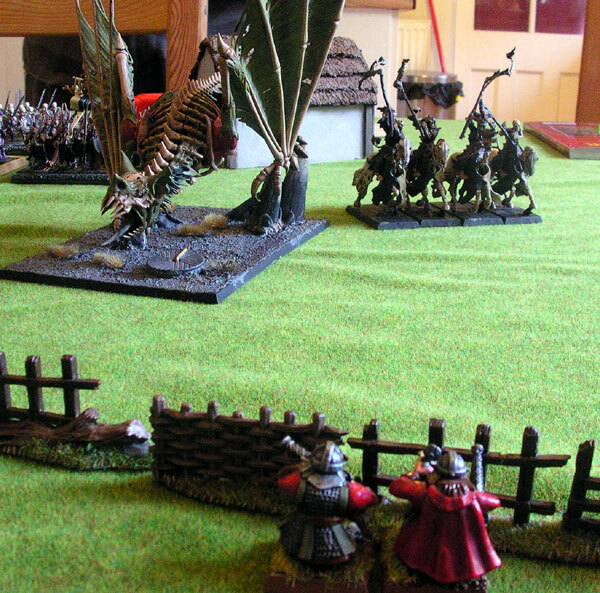 My first game was against one of the perfidious vampire players and due to some unfortunate rolls I was starting on 1850 points to his 2K. I also misread the rules a bit, so was even more hamstrung than the rules intended. The game was notable for repeated low rolls on the winds of magic - I think the highest was 8 and we had at least two of double 1. My Hellcannon blew up on turn one, and I had a short and painful reminder not to go toe to toe with a big unit of graveguard. 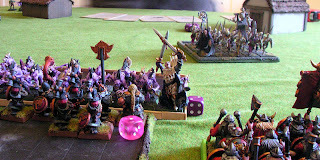 The combination of a slightly smaller army, not picked as well as it might be, some terrible dice rolling and some all round poor play meant I was broken by the middle of turn four. Not the best start to a campaign, I'm sure you'll agree. 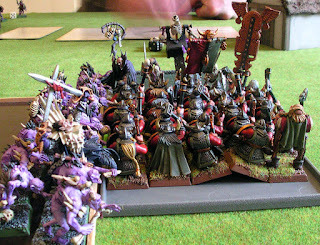 But a good fun game that started to show me some of the fun to be had with a Warriors of Chaos army. 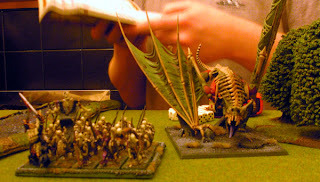 On Thursday four of us assembled to play some Warhammer. We're due to kick of a small campaign so this was an excuse to get the armies out for a warm-up. 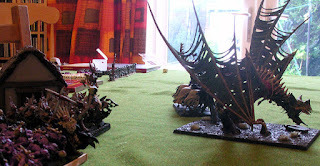 Sadly my camera saw fit to behave very poorly, so I can but apologise for the poor quality pictures. 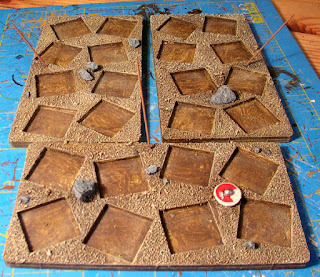 However, having taken them I figured I might as well slap 'em up. 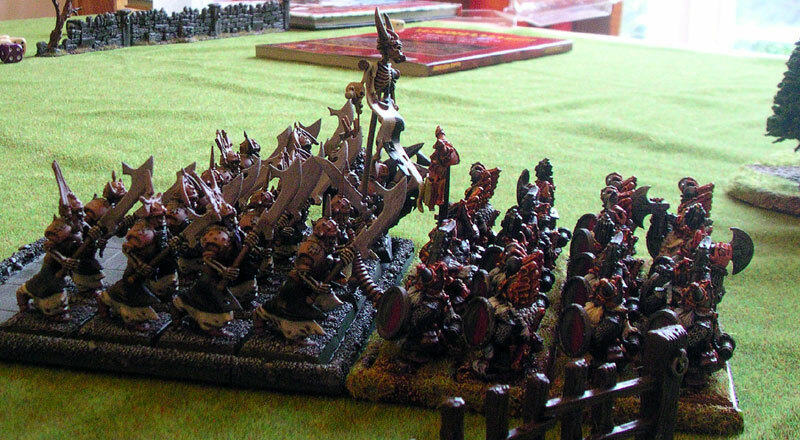 We played Blood and Glory with a minor variation. 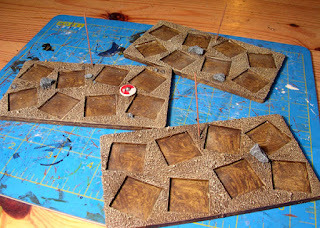 In one corner of each side was a terrain feature desirable to the opposition. 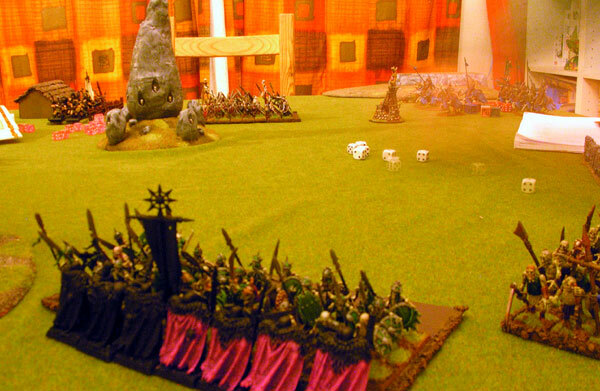 A Temple of Skulls and a Graveyard respectively. Having a unit of five or more models on the feature counted as an additional point of fortitude for your army. We also tried out the rules from the BRB scenarios section where each player can only talk tactics with his team mate if he uses up a "messenger". Each player has two messengers, granting three minutes of conversation with his team-mate. 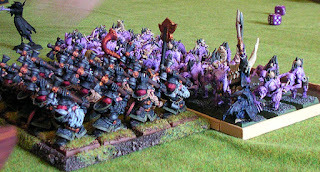 Apart from that you can converse about rules, beer and whatever else floats your boat, but not the tactics of the game. 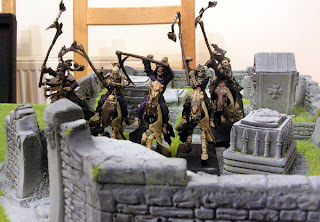 The undead shamble to their doooom! 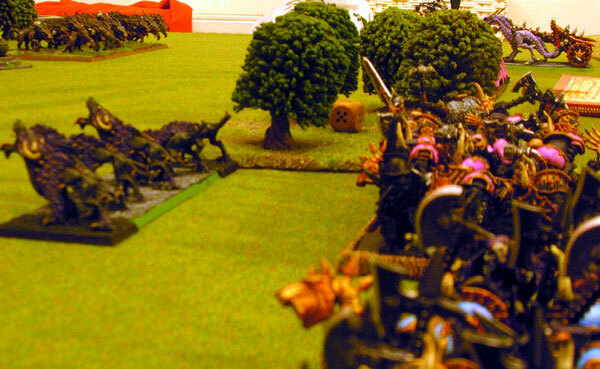 The chaos and rat alliance edged forward a little and prepared to unleash a storm of magic and war machinery. 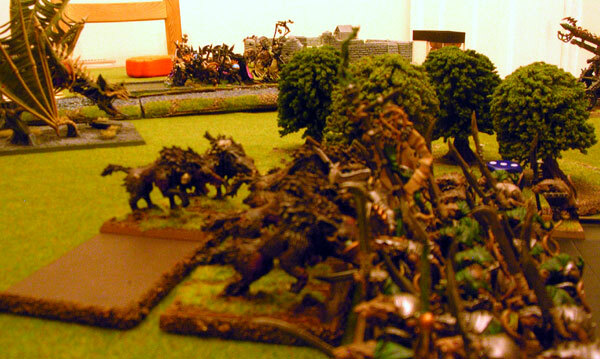 Hall-Scurry promptly miscast and the Warp lightning cannon hit the terrorgheist only to roll a misfire for strength. 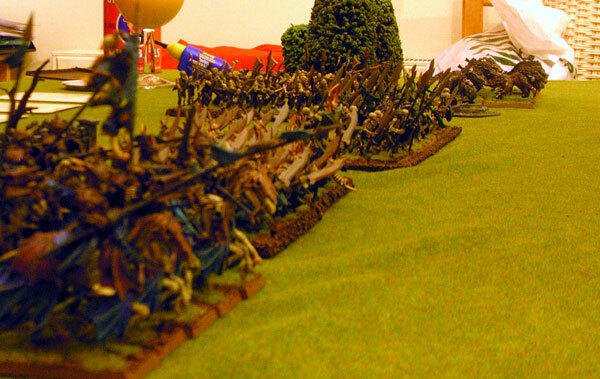 This was to form a pattern for the rest of the battle. 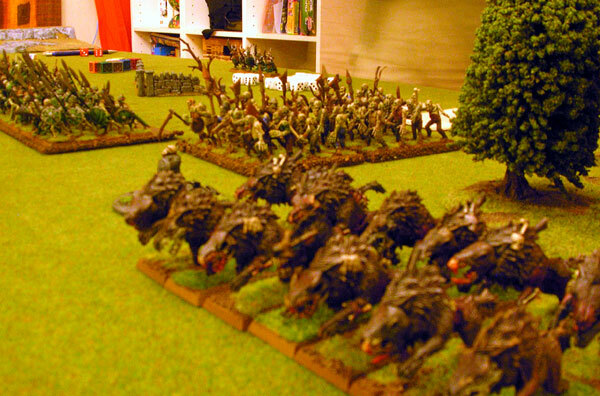 My marauder cavalry moved between the Direwolves and ghouls, hoping to get around into backfield to cause havoc (or at least some irritation). 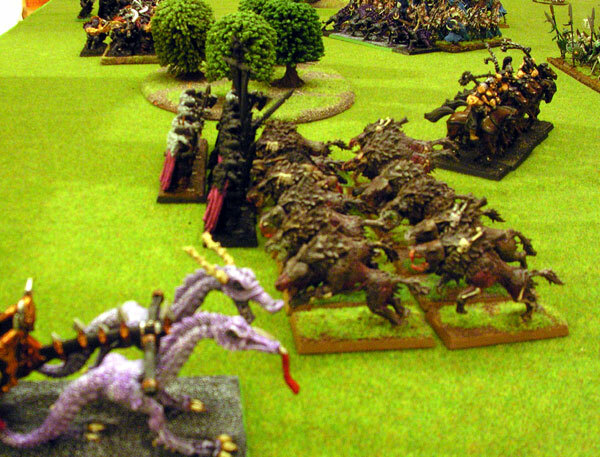 Sadly the Terrorgheist had other plans and breathed on them, leaving just one alive. Meanwhile the Skeletons led by their vampire made good progress toward the graveyard supported by the Hexwraiths. Over by the ford Ghoulies clashed with rat Ogres, with poison (and poor dice) helping to even up the fight. 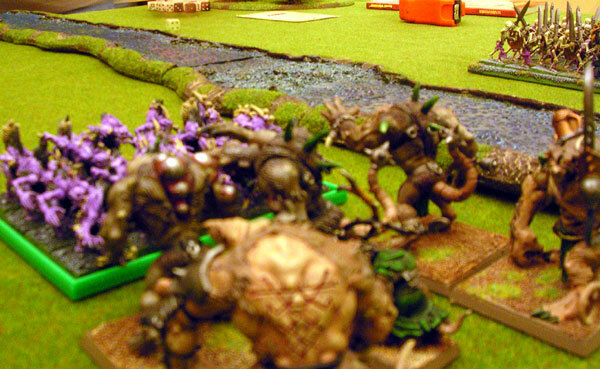 The Plaguemonks hurled themselves at some undead constructs, but failed (again) to get Deathfrenzy off which might have helped. And the Warp lightning cannon kept right on missing and failing to wound anything. The Tzeentch Chaos Warriors were giving a good account of themselves, despite the fearsome presence of the vampire, and the hexwraiths were thrown in to help. 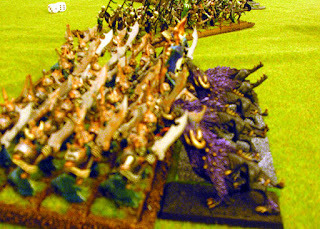 In the centre the Graveguard got in a long charge to crash into the front of the Slaanesh warriors. The huge unit of clanrats meanwhile was struggling to kill ten Direwolves. Finally the Terrorgheist (still largely un-singed) was launched across the river into the flank of the Tzeentch warriors, and with that they were wiped out. As usual a good fun game. 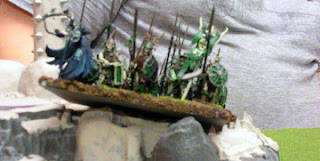 I was pleased with how hard the warriors are and am looking forward to using them in the campaign (though I'd like to get some of the new warrior models painted!). The rules about not talking to your compatriot were fun, but two messages each is probably too many two or three per side in total would add to the hilarity. My new job doesn't start until tomorrow and my regular WFB chum has a few days off work, so clearly a game of Warhammer was in order. 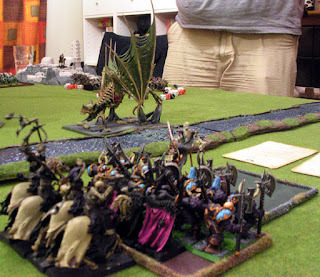 We rolled up the Blood and Glory scenario, settled on six items of terrain and then lined up and went at it. I was intending to use a Dwarf list with a fighty Lord to lead it as the magic sapping abilities of the Runesmith with Anvil list had made it a tough slog for the Necromancer led list they'd fought last time - however I couldn't locate the list in time and anyway my opponent had tooled up with a fighty Vampire to lead the line on this occasion. I deployed a little to the left in my deployment zone and the cursed hordes of Undeath bunched up opposite me to try and stay close to their leader. 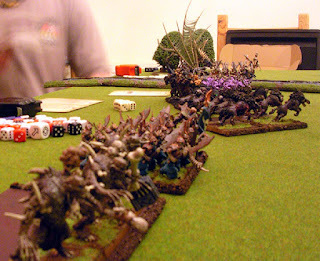 The Vamps finished deploying first but I won the roll and elected to go first. I didn't move much. The Thunderers walked up the the fiery fence that stood in front of them and the Longbeards moved to hold the flank, but other than that we just locked and loaded. 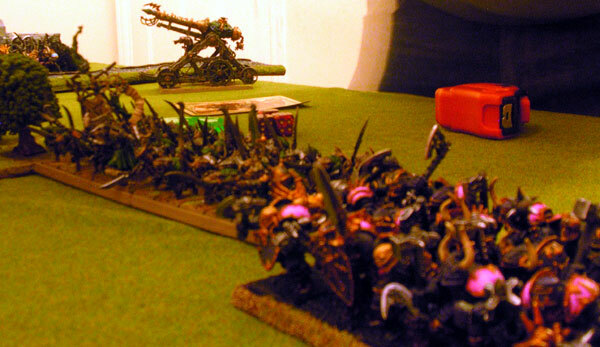 The canon took careful aim at the huge Terrorgheist and misfired. 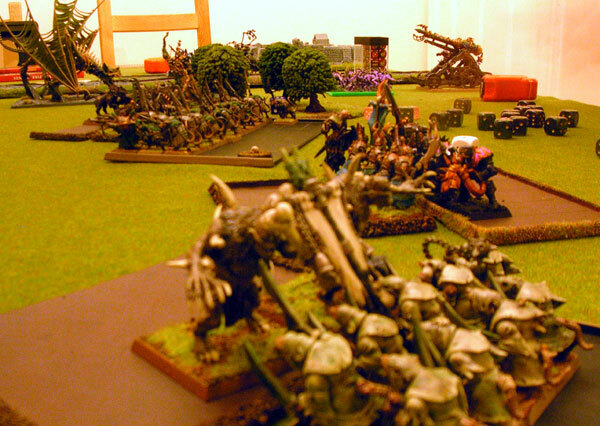 The crossbows killed a couple of Ghouls and the Anvil killed a single hexwraith. 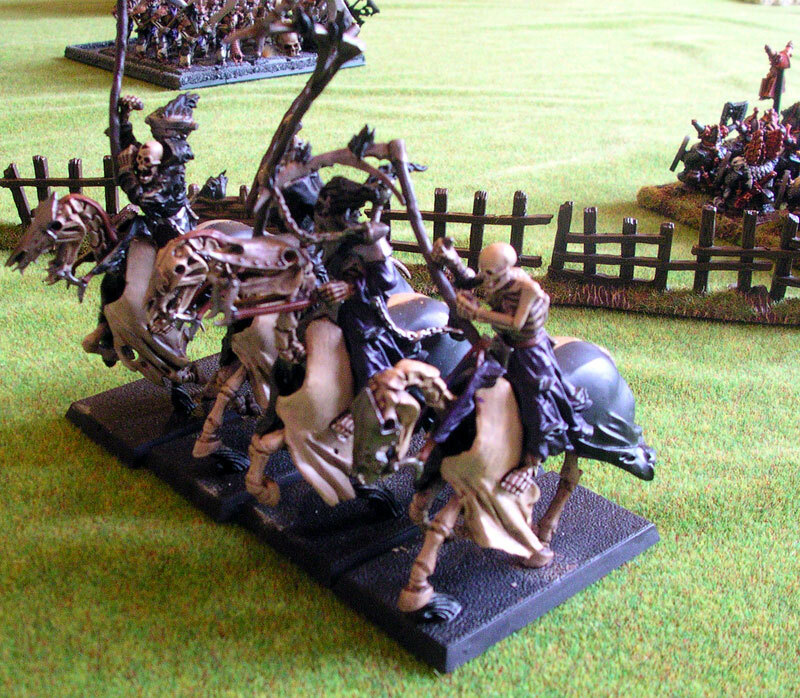 Gunlines are awesome. The dead shuffled forward with the Terrorgheist leaping forward to shreik terrifingly at the Thunderers, killing eight of them! Meanwhile some Zombies emerged from the earth right in front of the Organ Gun. Almost like some sort of meat shield. 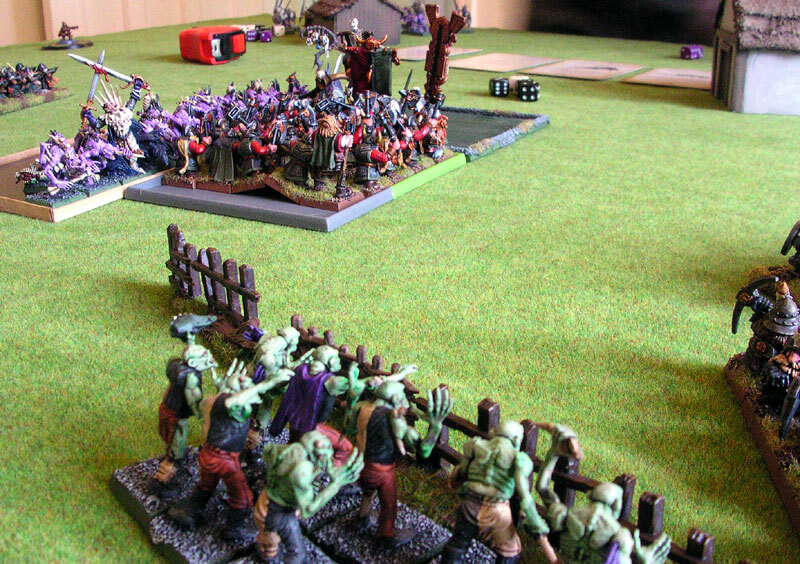 However as it was a miscast the magic ended at this point with a couple of Ghouls being blown up in the process. 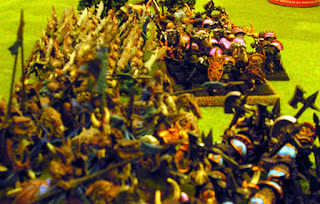 Again the Dwarf line held pretty steady and got ready to shoot. 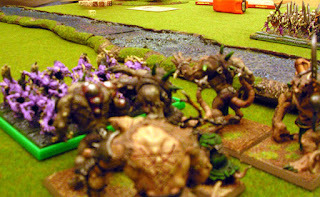 The Thunderers failed to hurt their nemesis, but a cannon shot and some lead from the Organ gun sent the huge beasty to it's doom. 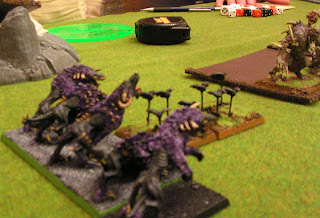 The Vampires continued their forward shamble with the Hexwraiths running over the remaining Thunderers killing them both. 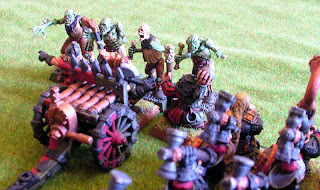 The Zombies hurled themselves at the Organ gun and forced a draw in the ensuing fight. 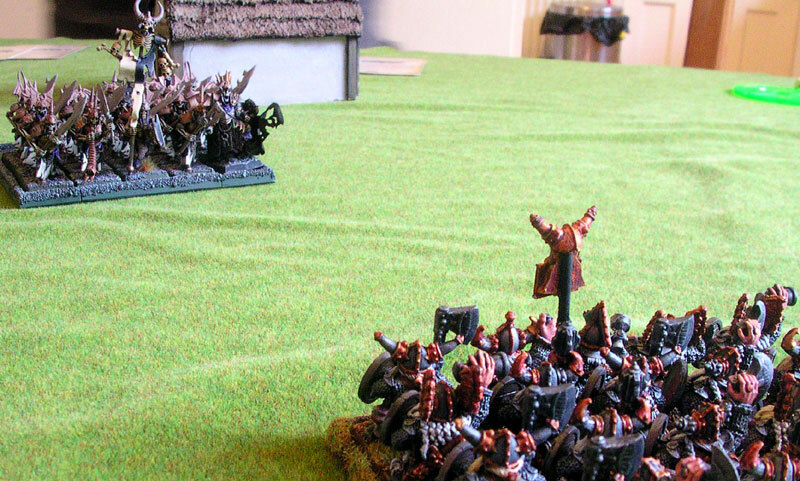 Meanwhile the Longbeards faced off against the grave guard on the right flank whilst the Lord of undeath urged his horde forward. 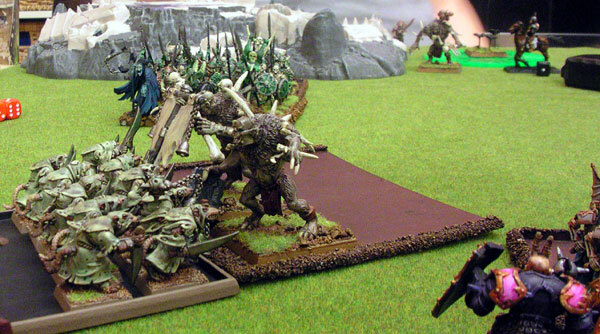 The Vampire and Ghouls took a fearful toll of the Hammerers but they stoically held whilst the Longbeards fared better against the Grave Guard. 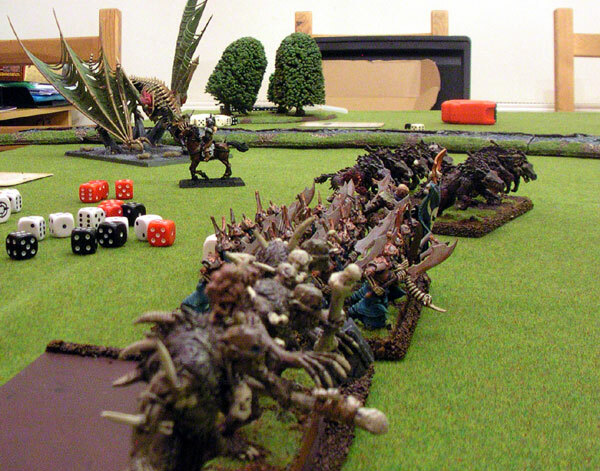 In backfield the Hexwraiths glided across the anvil, killing both guard whilst the Organ Gun crew eventually dispatched the zombies. "Heigh-ho, heigh-ho a killing dead things we go!" 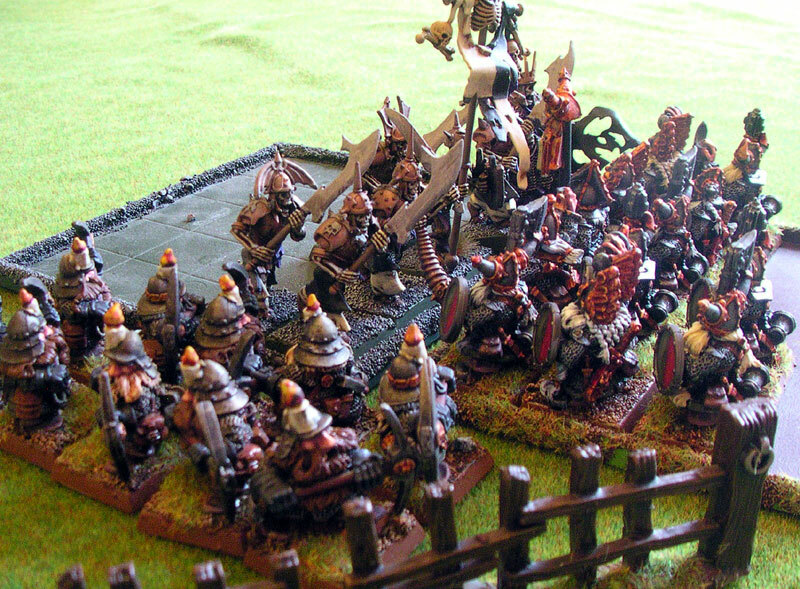 Despite the heroic efforts of the Thane the Hammerers were eventually ground to nothing by the fury of the Vampire Lord, but the stout Dwarf Warriors crashed into the Skeletons and the late arriving Miners ensured the Grave Guard were all cut down. 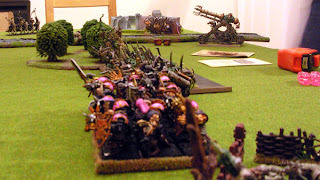 Charging on into the Organ gun and wiping them out the Vampire Lord re-arranged his Ghoulies to strike back at the Dwarf Warriors who were not chopping the skeletons down fast enough. 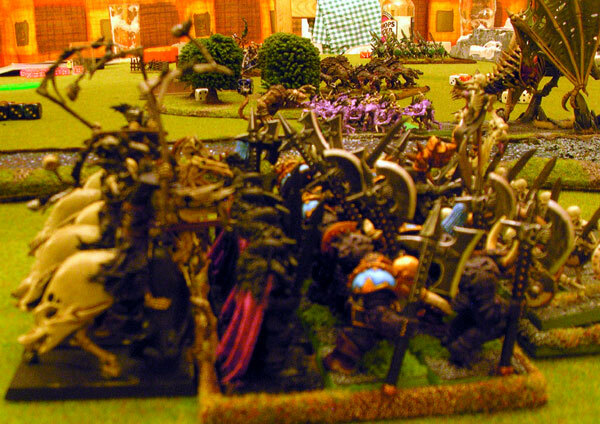 Meanwhile the Banshee made enough racket to burst the Runelord's eardrums and suddenly the Dwarfs were in trouble. 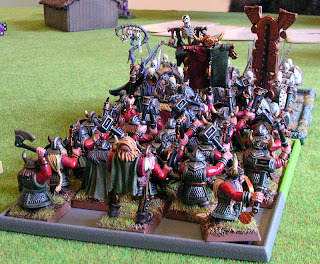 The Vampire and his poisonous minions smashed into the side of the Dwarf warriors and the Dawi began to sing their death-songs. The Vampire Lord, free at last to wreak magical destruction with the passing of the Runelord worked his dark powers only to suffer a miscast. With a mysterious sucking sound and a peculiar sulphurous smell the mighty undead lord vanished into the magical realm and with that the battle was over! A really fun game that hung in the balance to the very end. The combination of Anvil, Runelord, Rune of Balance and some poor magic dice meant the Vampires had a tough time of it and yet if it hadn't been for the final miscast they would probably have cut straight through the Dwarf unit to claim victory. 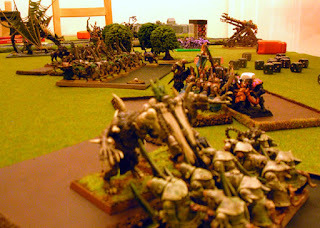 A good fun game, and very fast - though with one side not playing in the shooting phase and the dwarfs avoiding both magic and, largely, movement it was always likely to be! Over a white undercoat I painted them with some cheap sampler emulsion paint from Wilkos - Java Bean similar to the old GW scorched Brown then a drybrush with a warm orangey colour similar to Bronzed Flesh and finally Crushed Almond, a dead (arf!) ringer for Bleached Bone. The rocks I picked out with Charadon Granite - drybrushed with a couple of lighter greys, the Spears with some brown or other and the shield got a spare LBMS transfer. Not looking too bad IMO. 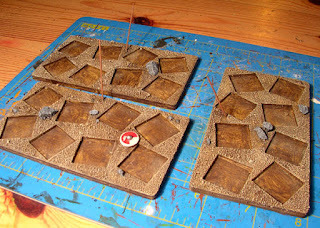 Still some work to do, including some grass tufts to add but they should be finished soon. A while ago I picked up a copy of Dux Bellorum at a very reasonable price from the excellent Northstar. I had a look through, got quite excited and then the Hobby Funk hit. 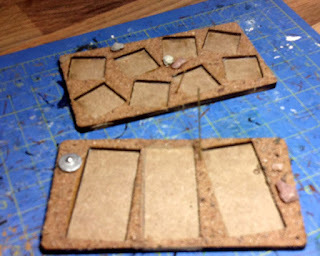 As an attempt to crawl out from the Funk I started work on some sabot style movement tray base things (a catchy title) for the game. 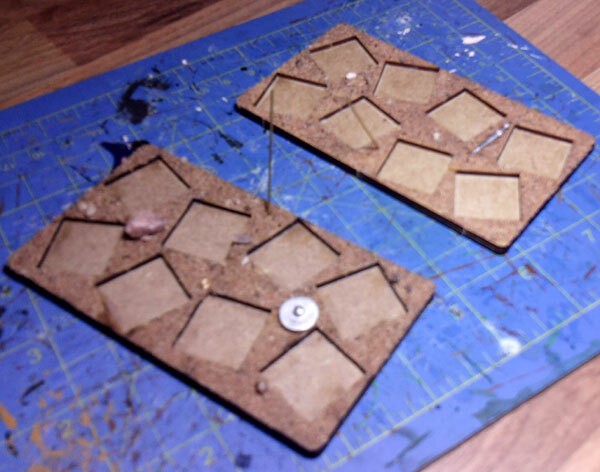 Dux Bel uses an element based system and as my Saxons are individually based for WAB I needed some kind of sabot to put individual figures in. 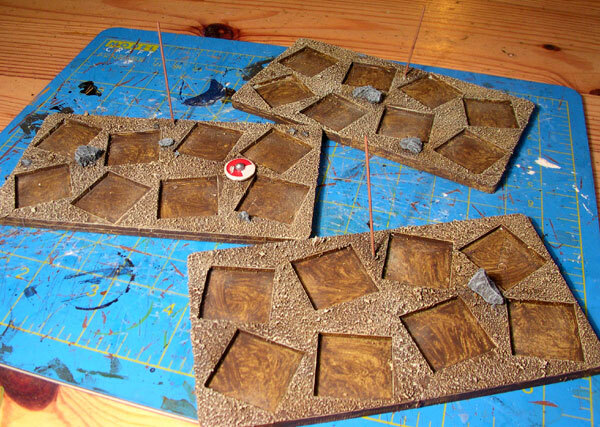 Whilst at Partizan I spotted these skirmish trays made by 4Ground which looked to be the right sort of size, so I grabbed the only pack in stock and took them home. Reviewing them, they seemed exactly right, they are roughly 11cm x 6cm and hold 8 20mm square bases, which will look fine for an element of the more barbarian style armies (such as my Saxons). 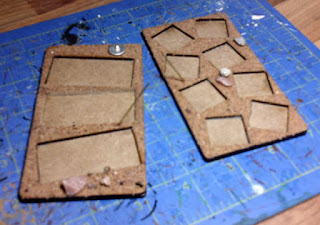 They also have rounded corners which I found pleasing to the eye. 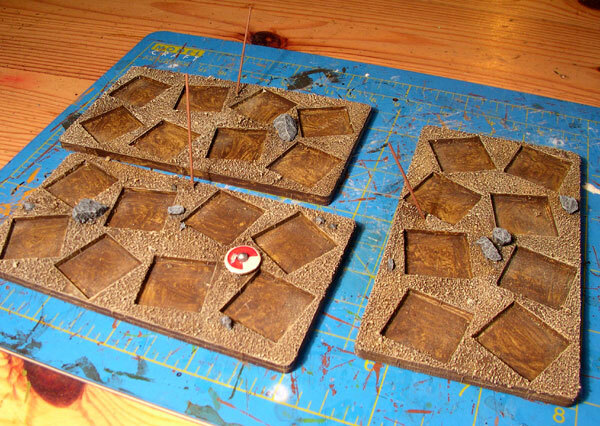 So I placed an order with 4Ground for three more packs to give me 12 bases in total (more than enough for most armies in the game). 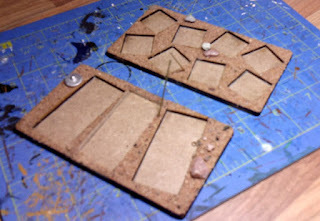 The only slight problem was that 4Ground don't make a cavalry base to the same dimensions and all elements in the game need to be the same size. 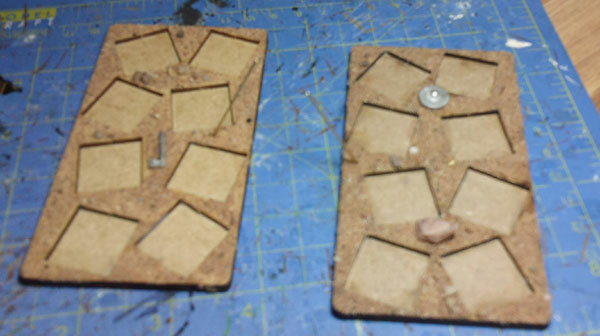 I did ask 4Ground if they could make some, but they're snowed under with work apparently - though they did suggest Warbases would do custom ones if I asked. In the end I took a punt on buying some of the 4Ground cavalry bases and figured I could do something with them - which it turned out I could. Their cavalry bases are the same depth (6cm) as the infantry ones, so a simple "cut and shut" job meant I could leave a gap in the middle large enough to hold a third horse while using a base piece from the infantry packs to get the correct frontage. I then sanded (as in covered them with PVA and modelling sand rather than took a Black and Decker to them) the bases and added a few rocks and a smattering of debris in the form of abandoned weapons and bucklers. 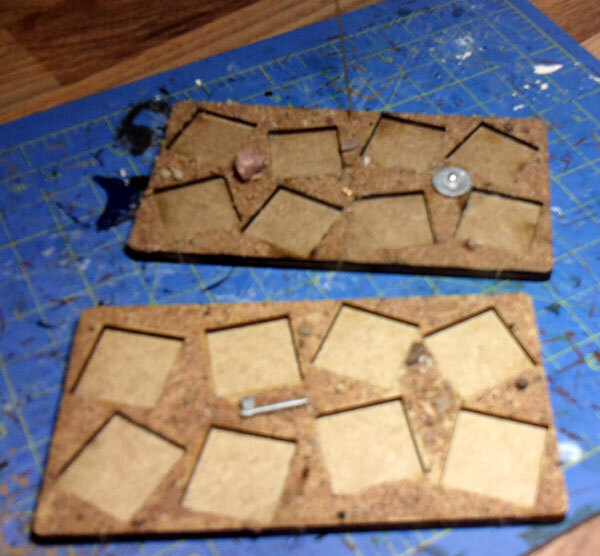 I also embedded a brass rod spear in the rear of each base as a way to hold the little rings to record casualties, much like we've done in our Hail Caesar games. 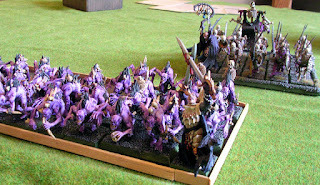 Below are a few photographs. Once again apologies for the poor quality pictures, that's the last time I use the new camera for stills, honest. 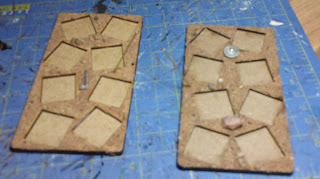 The first of these have now been sprayed white (to seal the sand as much as anything) and will hopefully receive a first coat of paint sometime tomorrow.